While drumming with your hands can be fun on a set of bongos, traditional drums require the use of the right tools to produce percussive greatness, and these tools are a good pair of drumsticks. Drumsticks come in a plethora of shapes, sizes, and even materials, and finding the right set for your own music takes patience and more than a little bit of knowledge. We’ve pored through all of the myriads of options that are available for drumsticks and came up with three great models of sticks that are great for making quality music. For those who are more budget conscious and may want to buy several sticks at once, we’ve also rounded up a great bargain set of sticks for your consideration. Founded in 1963 by legendary musician Vic Firth, the company came into existence as the result of its famous founder finding that the drumsticks that were available at the time were of too low a quality. Vic hand whittled some drumsticks and sent the prototypes off to a wood turner. What resulted was the first versions of the now iconic SD1 and SD2 models of drumsticks that many musicians use today. The American Classic series of 5A drumsticks continues that iconic tradition by incorporating Vic’s design into a new generation of sticks for drummers. Crafted of high strength hickory, these drumsticks can withstand thousands of attacks without chipping or warping noticeably. 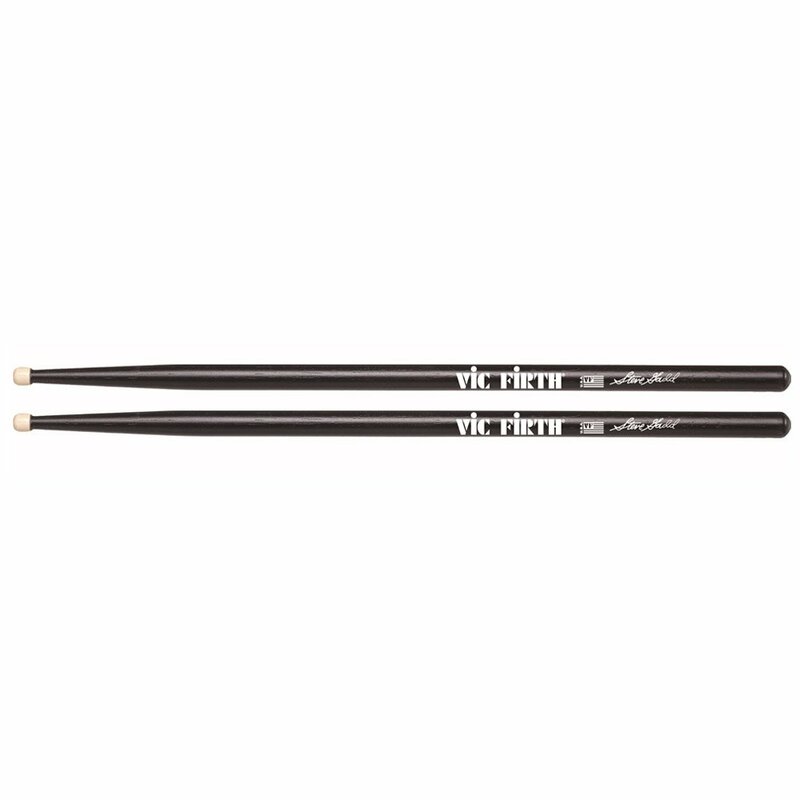 With drumsticks, aesthetics definitely take a backseat position when compared to functionality, but somehow the folks at Vic Firth were able to include Vic Firth’s legendary design along with a visually pleasing form factor. Like many 5A sticks, these are roughly 16 inches in length. They are also slightly heavier than other 5A’s; at a robust seven ounces. The barrel tapers smoothly to the oval-shaped drum tips. These tips are also back-cut, which ensures that you’ll get the best level of cymbal response with these drumsticks; all without suffering extensive damage to the tips themselves. Emblazoned on the barrel of these sticks is the iconic Vic Firth logo as well as a stylized American flag. Also positioned in this area, is the American Classic logo and the stick type. Being comprised of hickory, beginners can be at ease when cutting their teeth in the drum world. This is because the hickory construction is strong enough to withstand the extensive punishment that is common to someone learning the ropes of drumming, yet is light enough not to cause an overabundance of arm fatigue. This hickory construction is also perfect for more experienced drummers, as this type sounds great for a consistent warm sound that goes really well with the majority of musical genres. Also, since this employs an oval styled drum tip, you can expect truly versatile performance from these drumsticks, so feel free to explore musically. Zildjian was founded on a fantastical premise; its founder was an alchemist from the Ottoman Empire who wished to find the means to turn metals into gold. As a result of his research, he created an alloy that resonated perfectly when forged into cymbals. Today, nearly four hundred years later, Avedis Zildjian’s descendants still craft fine musical instruments and still employ their forbearer’s secret formula to create exceptional ride, crash, and hi hat cymbals. As the producers of our Silver Pick, you can expect that Zildjian would create drumsticks that are worthy of their family’s iconic name. The first thing that you might notice when looking at this set of drumsticks is the “black dip” that encircles half of the drumstick’s barrel. This unique aesthetic feature also has practical purpose; the black dip makes the barrels much easier to grip for the drummer and also reduces the impact effects on the drummer’s hands. This smooth coating feels like a plasticized lacquer that is slightly tacky and sports the famous Ziljian logo in gold foil lettering. Having this coating will allow you to relax your grip somewhat while you drum, and will help you achieve a more natural feeling rebound. The remaining half of the barrel is crafted of hickory. Hickory is a great choice for these as its lighter-than-oak construction works well with the added grip of the black dip. The tips of these sticks are comprised of nylon. Nylon is the perfect substance for the beginner as it will not chip even if exposed to numerous heavy cymbal strikes. Its shape makes the sticks versatile for almost any kind of drumming and nylon also sounds very bright compared to wood tips. 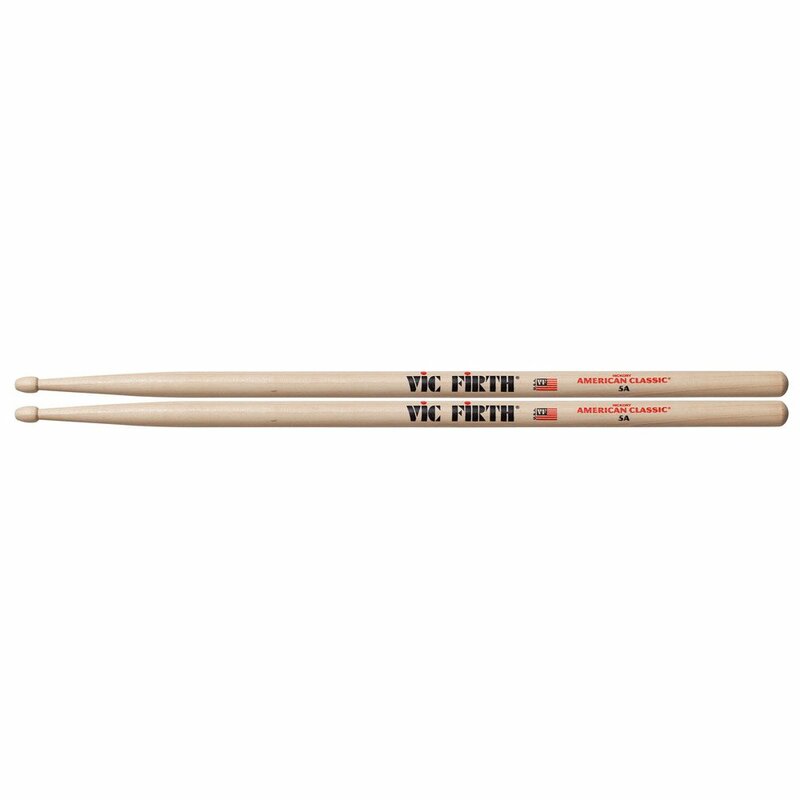 Another superb set of Vic Firth drumsticks, these excellent drum tools not only invoke the name of the company’s founder, but also the name of legendary drummer hall of fame inductee Steve Gadd. This famous drummer has worked on bands such as Steely Dan and on iconic albums such as Paul Simon’s 50 “Ways to Leave Your Lover”. Incorporating some of the stylistic cues that Gadd has become famous for, these drumsticks almost scream style and function. This series of drumstick was actually developed in the 1980s by both of the musicians whose names appear on the barrel. Both Vic and Steve’s brainchild, this signature series offers a build quality and sound performance for beginner or professional drummers alike. The first thing that you might notice when seeing these sticks is that they are wooden sticks that are painted black. This black coating makes for a grip-friendly tactile experience when you’re playing, though some drummers have reported that the paint can sometimes chip. The second thing that you might notice when comparing these sticks to the previous picks, is that these sticks employ a barrel tip. Barrel tips are great for recording music and produce a much more robust sound that’s also great for corps drumming and heavy cymbal usage. Since they are constructed of hickory, you know that as a result of their shape and wood type, you’ll be able to attack your drums thousands of times before you start to see any wear and tear along the tip’s surface. These sticks are of a 5A variety and come in a little shorter than some of the others on our list; around 15.8 inches in length. They are also amazingly light; an astounding 3.2 ounces. If you are ballin’ on a budget but want a good set of reliable yet cheap drumsticks, look no further. Our ballin on a budget pick may seem generic (as a matter of fact that’s how they’re described), but that doesn’t mean that they won’t provide you with an excellent percussive experience. To start, these are 5A drumsticks but they’re also available in 2B and 5b sizes. The larger size of 2B makes them thicker than any of the other sticks on our list. This can be great for a beginner who really wants to work on their grip; the heft and circumference of these will mean that they will be that much harder to fling across the room during your practice sessions. This isn’t to say that 5A slips a whole lot easier; it just means that you’ll have more to grip when using a thicker drumstick. These sticks are comprised of hickory and are light and springy; they actually only weigh 3.2 inches and are 16.5 inches in length. The tips are oval, which lends to overall versatility when playing through musical genres. • Hickory – A problem with wooden drumsticks is that repeated cymbal attacks can cause the wood tips to degrade and chip. Hickory is a very hard type of wood drumstick and tends to not suffer with this issue as much as maple. This is the perfect type of wood-type if you are a hard hitting drummer but still want some lightness in your sticks. • Oak – An even harder wood than hickory, oak is the heaviest of the wooden drumstick types. You can expect even the most extensive cymbal attacks to do minor damage to oak sticks, though, since they are made of wood, they will degrade over time. • Maple – The lightest wood-type of drumstick on the market. They don’t do well with extensive cymbal usage, but are perfect for light drumming. As a rule, maple sticks tend to play a bit faster. • Nylon – Nylon tips tend to have a haft of wood but are tipped with a plastic-like nylon. These will not chip at all and tend to produce a different sound than wood-tipped drumsticks. Some drummers find that this type of tip generates a more consistent sound and stands up well to more vivacious attacks. 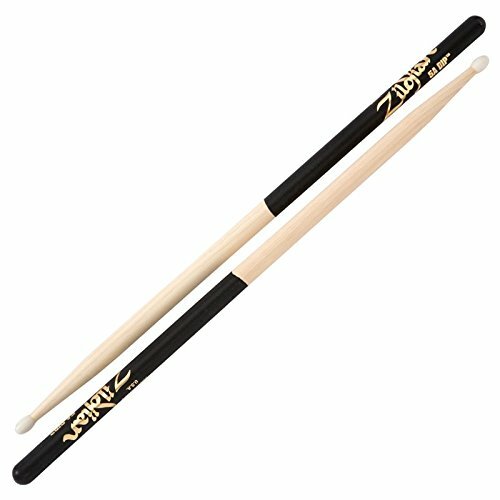 • Aluminum – Constructed of aerospace –styled aluminum tubing, these types of drumsticks have a tip and upper half comprised of polyurethane. Many drummers feel that this type of metallic drumstick has better rebound than even the springiest of wood types. When looking for your next drum stick, be sure to know what kind of materials you’ll need to produce the sound and the results you are looking for. Take into account rebound, durability, and sound so that your drum beats will be what you want them to be. As a rule, the 5A drumstick is best for average sized hands. 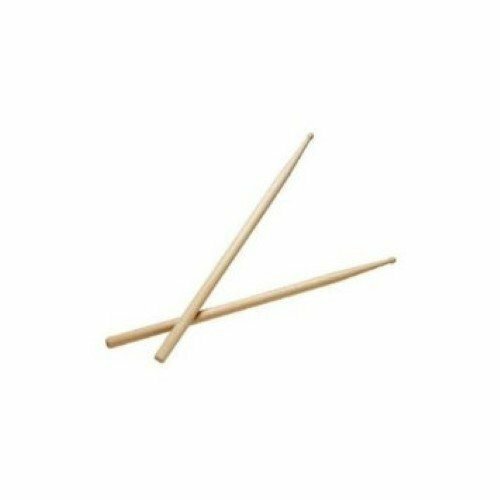 If you find that you have smaller hands, then maybe a 7A stick would be a better fit for your drumming. To get an idea how the sizing of drumsticks work, here’s how the lettering and numbering system works; the number equates to the sticks circumference and the letter indicates the stick’s size and application. For example, the higher a sticks number the thinner it will be, which is why a 7A is best for smaller hands. More thickness is indicative of more weight, so the smaller the number, the heavier the stick. Insofar as how size and application is measured, “S” sticks are much heavier and thus are best for street performances, “B” sticks are great for rock as they are much easier to control, and finally “A” is perfect for when you don’t need massive volume; as in when playing in a jazz band. Teardrop – Great for jazz; produces low, clean tones. Round – Produces a very clean percussion; this type is perfect for snare drumming and jazz. Barrel – This is the style best employed in corps drumming. This is the best type to utilize with heavy cymbal striking. Oval – Produces a warmer tone. This is a very versatile tip-type used for many different types of music. Acorn – Is very durable and produces a fuller sound that’s perfect for rock music. Nothing beats the springy feeling of striking a drum pad with a great, reliable drumstick. Whatever your favorite genre, always remember that there is a drumstick type that will really make your music shine. Take into account our list of excellent picks, think on our pre-purchase considerations, and in no time, you’ll be producing some truly epic percussion.